(19/P011) TRENTON – Moving forward on its commitment to clean transportation, the Department of Environmental Protection is transmitting to the Volkswagen Environmental Mitigation Trust for approval the allocation of $11.2 million from New Jersey’s share of the federal Volkswagen settlement for hundreds of electric-vehicle charging outlets across the state and new electric NJ TRANSIT buses in the City of Camden, Commissioner Catherine R. McCabe announced today. The projects are the first to be announced for funding from the Volkswagen Mitigation Trust, from which New Jersey is receiving $72.2 million. Governor Phil Murphy has committed to using 15 percent or $10.8 million of the state’s settlement amount for electric-vehicle charging stations. In addition to these projects, the DEP is evaluating more than $400 million worth of other project applications and expects to announce additional awards before the summer. One focus of the funds will be on environmental justice to communities which are disproportionately impacted by pollution and resulting health impacts. The new electric buses in the City of Camden will be a step toward electrifying public transportation in New Jersey. 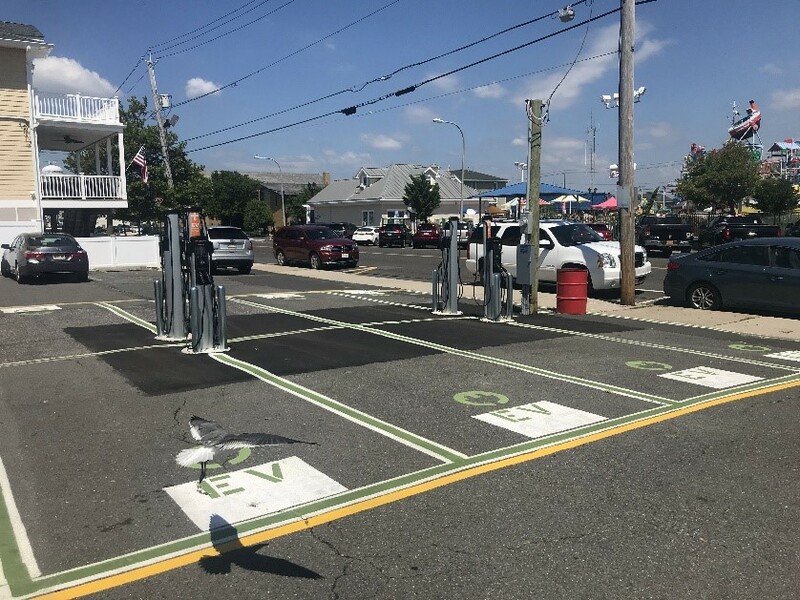 The DEP will use $3.2 million to award grants for approximately 827 charging outlets at 533 charging stations under It Pay$ to Plug In – New Jersey’s Electric Vehicle Charging Grant Program, more than doubling the number of non-residential charging outlets in the state. New Jersey has 786 charging outlets at 322 public locations across the state. Grantees in this first round of funding include 55 municipalities and counties, public parking lots and garages, apartment and condominium complexes, car-share services, hotels, private companies and nonprofit organizations. Charging stations also will be installed at select NJ TRANSIT commuter rail stations and at rest stops along the Atlantic City Expressway. An additional $8 million is proposed to the Volkswagen Mitigation Trust for allocation to purchase eight new electric transit buses to be operated in the City of Camden. In reviewing additional funding applications, the DEP is focusing on reducing smog as well as greenhouse gas emissions, expanding the use of electric vehicles, and advancing environmental justice goals by using electric public transit buses, school buses and other zero-emission vehicles in communities that disproportionately bear the burden of air pollution. The Volkswagen Mitigation Trust is the result of federal actions against the automaker for installing “defeat” devices that allowed vehicles it manufactured to emit pollutants without being detected by emissions-testing programs across the country. Two partial consent decrees approved in 2016 and 2017 established a $2.93 billion environmental mitigation trust to provide funds to all 50 states, the District of Columbia, Puerto Rico and federally recognized tribes to implement actions to counter the air quality impacts of excess nitrogen oxide emissions resulting from the emissions defeat devices. In New Jersey, transportation sector emissions account for 71 percent of nitrogen oxide emissions as well as 42 percent of greenhouse-gas emissions. Nitrogen oxides are a major contributor to smog, which forms when pollutants interact with sunlight and hot temperatures during warmer months to create ground-level ozone molecules. Ozone is beneficial in the upper atmosphere by shielding harmful rays from the sun but is a health hazard at ground level. Ozone irritates tiny lung sacs known as alveoli and can increase asthma attacks in asthmatics and make people more vulnerable to lung diseases such as pneumonia and bronchitis. Long-term exposure to ozone particles can cause lung inflammation, chest pain, coughing, wheezing, sneezing, pulmonary congestion and scarring of lung tissue. While ground-level ozone levels in New Jersey have been improving in recent years, the state continues working to meet federal health-based standards for the pollutant. The process is difficult, however, because New Jersey is heavily urbanized and in the middle of one of the nation’s busiest transportation corridors. The state is also impacted by smog transported by prevailing winds from older, dirtier power plants in upwind states. DEP’s It Pay$ to Plug In program funds strategic deployment of electric vehicle charging stations across the state. The program offsets costs for the purchase and installation of charging stations at public places, workplaces and at multi-family housing complexes. Launched in June 2016, the program has approved more than $900,000 to 70 grantees for 188 charging stations. For a complete list of projects submitted to the Volkswagen Environmental Mitigation Trust for approval, visit www.nj.gov/dep/vw/project.html. To learn more about the performance, availability and comfort of electric vehicles, as well as how to save money and reduce pollution, visit www.drivegreen.nj.gov. For more information about the Volkswagen settlement and the DEP’s Beneficiary Mitigation Plan, visit www.nj.gov/dep/vw/.